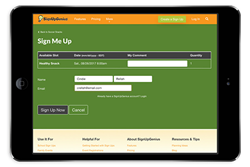 Online sign up service simplifies sign up process and group communication. SignUpGenius' new features include a faster sign up process and easier groups editing. Our latest site updates help people save time when signing up for events and coordinate groups more effectively. SignUpGenius, the leading online sign up service for event and volunteer management, has debuted several new features to make it even simpler for people to sign up for and organize events. Faster Sign Up Process: SignUpGenius account holders no longer need to log in to their accounts to sign up. Sign up information will automatically import into their accounts, and participants will still receive automatic email or text reminders. Easier Groups Editing: A new interface makes it easier for group organizers to export group data for offline use, as well as add or edit information about participants and transfer, duplicate or merge groups. Hundreds of New Designs: More than 100 new sign up designs have been added so group organizers can create custom, professional sign up forms. SignUpGenius has introduced several new features to boost planning this year, including text messaging updates, multi-photo theme designs and an integration with Zapier that allows users to sync sign up information with popular apps such as Salesforce, Constant Contact and Google Sheets. Fall is the busiest time of year at SignUpGenius as school activities resume, groups return from summer breaks and fundraising ramps up. Up to 12 million people per month use SignUpGenius’ tools, and 66 million unique people visited the site last year.